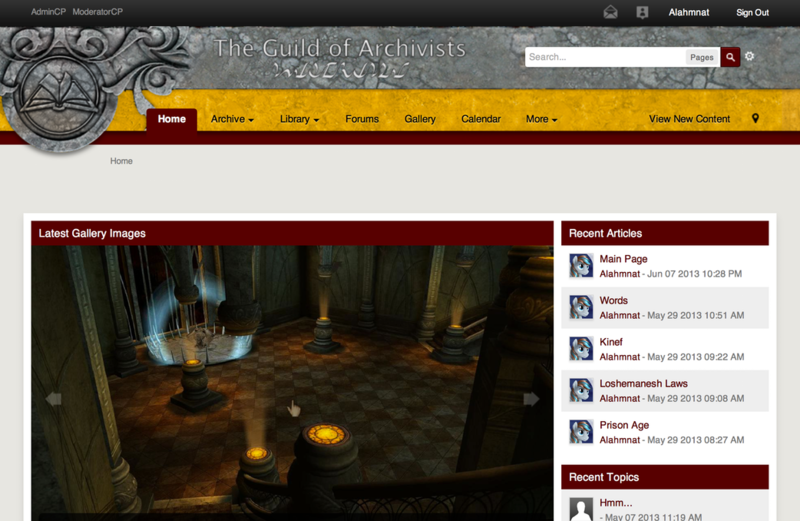 The Guild of Archivists is a new site that serves as a replacement for DPWR.NET. It runs on the latest version of the Invision Power Community Suite, and has been refocused to serve two primary functions: a wiki-like information archive for the Myst series of video games, and a place where storytellers can discuss how to expand the “extended universe” of fan-created content in a manner consistent with the canonical world of the games. In order to facilitate the expansion of the information archive, I wrote a number of BBCode plugins in PHP. These plugins have made it possible, for instance, to “hot-link” to another article just by using its name, and include dynamic tables of contents that are built from the on-page header tags. The logo for the Guild of Archivists is based on a texture from Myst Online: Uru Live, and was edited by Keith Lord to include the logo mark from DPWR.NET.